We use our marine research to globally inspire conservation. We aim to help people better understand these pelagic animals, the importance they play in their marine ecosystem and the threats they face everyday. The threats pelagic species face have no boundaries! Because of their highly migratory life, the need for international cooperation and protection is imperative! 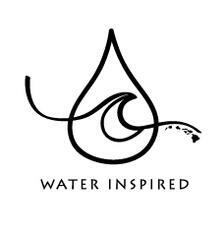 Our goal is to inspire people worldwide to use their voice to help conserve and protect these amazing animals! Click the link above to join us at our beach cleanups or educational events! Click the link above to submit testimonies and speak up for marine life! SHARKS: With 90% of shark species already gone in just the last 20 years, shark fin soup, an Asian delicacy, is threatening the survival of sharks as a whole. Although there a multiple threats to sharks, shark fin soup is the biggest contributor. It is estimated that 100 million sharks are killed annually, the majority of those shark just for this dish! This horrific act often involves cutting off only the fins of the shark while it is still alive and then throwing it back overboard to slowly die, often from suffocation or bleeding out. Only eat sustainably-caught seafood, as sharks are regularly unintentionally caught and killed by the fishing methods that many large-scale fisheries use. Don't buy shark teeth. If you do, make sure that they are fossilized (black) and from a trusted source. If they are white, the teeth most likely came from a shark that was harvested. Don't buy from or support restaurants or businesses that sell shark fin soup or other shark products. Get involved with organizations that support the protection of sharks and the ban on shark finning! 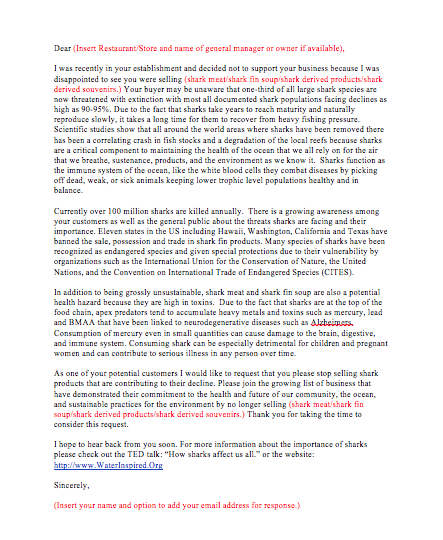 Also, ask your local and state government to ban the right to fish for sharks recreationally and commercially, as well as to ban the selling and shipping of sharks and their fins. Kennen sie einen speicher oder restuarant, das verkauft shark products / shark fin soup? Download und zeigen dieses brief zu diesem bertrieb zu geben! Conosce un negozio o un ristorante che vende prodotti di squalo / zuppa di pinne di squalo? Scarica e mostra questa lettera o dagliela a loro! Conhece uma loja ou restaurante que está vendendo produtos de tubarão / sopa de barbatana de tubarão? Faça o download e assine esta carta para dar a esse estabelecimento! ¿Conoces una tienda que vende productos de tiburón / sopa de aleta de tiburón? ¡Descarga y firma esta carta para dar a ese establecimiento! Kjenner du en restaurant som selger hai / hajfinsuppe? Last ned og skriv dette brevet for å gi til dette etablissementet! WHALES: Here in Hawaii, we are lucky to be able to enjoy annual Humpback whale migrations. However, these migratory animals are facing entanglement threats in our local waters and in the high seas, as well. Entanglement, most commonly due to commercial fishing gear, can lead to drowning, lacerations (deep cuts), severing of limbs, infection, and starvation. Entanglement can happen from a wide range of gear all across the ocean, including even far from human contact. This is why it is imperative that commercial and recreational fisheries refrain from dumping their unwanted, tangled, or broken gear overboard and properly disposing of it. Reduce as much plastic as you can (start off swearing off single-use plastic) and dispose of trash properly/pick up any you see. SEA TURTLES: Despite being one of the oldest marine animals, sea turtles are facing a number of threats. 80% of plastic pollution comes from land. It washes or blows from our rivers, storm drains, streets and beaches and into our oceans. As a result, sea turtles are accidentally ingesting and/or getting caught in this plastic pollution. When ingested, plastics can choke or starve sea turtles, as well as make them fatally ill. The common types of plastic pollution include: plastic bags, plastic bottles and caps, straws, food wrappers, and fishing line. Plastics do NOT biodegrade and break down! Instead, they photo-degrade (from the sun) and break apart into smaller and smaller pieces, which we call micro-plastics. Plastics in our environment today will remain in our environment for hundreds of years. Therefore, reducing our use of single use plastics will overall reduce the input of plastic pollution we are creating and help protect marine species from potential harm. Reduce your use of single use plastics: use reusable water bottles instead of plastic bottles, reusable bags instead of plastic bags, and say NO to straws (or bring a reusable alternative to use instead like glass or bamboo). One Ocean Diving is an official sponsor of the nonprofit shark and marine conservation group, WATER INSPIRED, founded in 2005 by Ocean Ramsey and Juan Oliphant. The goal was to inspire the world to care about and help protect marine life, with an emphasis on sharks. Today, the organization has grown to include an array of dedicated watermen and waterwomen from scientists, naturalists, professional dive instructors, photographers and videographers, as well as PhD, Masters, and undergraduate students in the marine-science field. Our goal is to help people gain a better understanding and appreciation for marine life in our oceans! KEIKO CONSERVATION is an organization dedicated to making a big impact through small actions of people worldwide. Through social media and online platforms, Keiko and One Ocean Diving provide an easy way for people to work together to make change at the local and global level. Keiko Conservation is a large part of our Humpback Whale Tour that focuses on research efforts to record and track whale song in order to better understand these animals and to inspire people to speak up for these beautiful wild and free animals.